In my opinion, the self-appointed, unelected Westhampton Free Library board is being disingenuous and deceitful in framing this budget increase as strictly a yes or no for employee wage increases. It’s a false, unfair choice. The employees should come first, before expanding and renovating our brand new building. And they should be fairly, objectively, and well compensated. The library has over $4 million CASH already in their bank accounts—so there’s money; included in that $4 million figure is $450,000 set aside for “Budget Stabilization.” The Salary and Benefit increase is for $131,212 in this budget—take the money out of that chunk of already stashed cash! Problem solved. If the budget were to be voted down—which I’m recommending for many reasons if you’d like to continue reading—the employees should still be fairly compensated, especially if “the board learned that its salary schedule was not on par with other nearby libraries” (see recent 27east article). It’s simply the right thing to do and should be the #1 priority—no matter what happens with this budget. In addition, I voted yes to secure a bond to build a new library. We now have a new library. 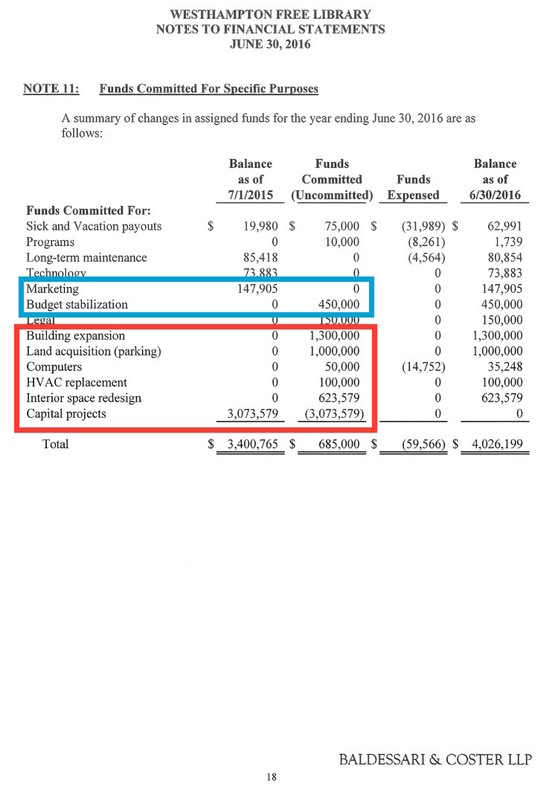 Over $3 million (from the $4 million figure mentioned above)—$1.3 of it is a donation, the remaining balance is mostly accumulated tax dollars—has been set aside for capital projects THAT WE DON’T VOTE ON AS A COMMUNITY. Interestingly, this money was earmarked for capital projects approximately 3 months after a union was voted in at the library, purposely taking these tax dollars off the negotiating table. Intentional? I say yes. Why are we REDESIGNING THE FIRST FLOOR of our library in addition to EXPANDING THE ATTIC (which we’ll need $ to clean, staff, air condition and heat it, too)? When is enough enough? A redesign? What a waste of our original tax dollars. Why doesn’t the Town of Southampton renovate the vacant eyesore on Mill Road by the 7-11 for a community center and some local jobs with the taxes it collects from us? How about our library being simply a library? The Westhampton Library is now selling sweatshirts. I waited 8 weeks for a book that I needed for book club. The book didn’t come in so I purchased it on Amazon. I can’t get a book at my library, but I can buy a sweatshirt. Maybe the attic can house additional retail items unrelated to books. Worth noting, another book club member couldn’t get the same book, and yet another book club member waited 6 weeks recently for a different book. We’re just a small sampling of the library population needing books that the library can’t seem to provide. But let’s make the new library bigger. The library board has had a trustee vacancy since November 2016. At least three eligible taxpayers submitted “trustee applications” but the private, closed club of trustees feel that none of these individuals meet their needs. We have three individuals in WHB running for the one open Board of Education spot. Would anyone care if the school board decided that this year they just weren’t going to have an election simply because they didn’t want to? 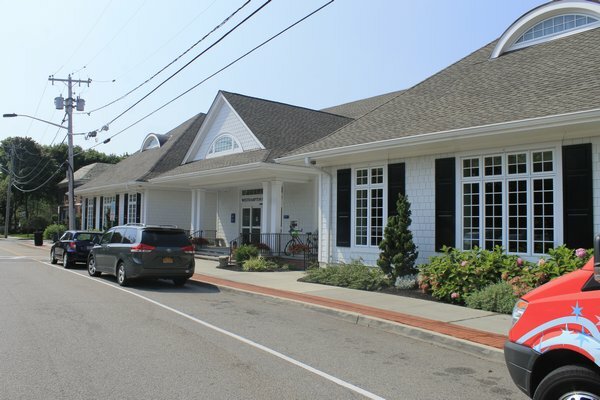 The Westhampton library can have an elected board. Self-appointed trustees Tom Moore, Susan Rosenberg, Barbara Matros, Robert Santucci, Mary Anne Yutes and Mitchell Schechter simply refuse to allow it to happen. Year after year the library collected multiple tens of thousands of dollars “extra” from the contract “feeder” districts. It’s shown in black and white on the audits, available on the library’s website. That’s how the board collected and accumulated the already millions of dollars that sits in the bank accounts in cash—and that six unelected individuals are now deciding how to use without a community capital project vote (like for turf and lights). I know this isn’t a hot button issue like water quality or affordable housing. Plus, the many summer residents here can’t vote, and we’re a less fiscally conservative area then Hampton Bays, for example, who just showed their self-appointed library board a thing or two by defeating two bond referendums (the articles and comments on 27east were great and are worth reading if you’re interested in this issue). But if you’re an American, democracy should matter. On principle I must vote no to the library budget increase and I hope my library friends will respect and understand my reasoning. I respect that this is your livelihood but I know that the self-appointed board can easily and instantly find the $131,212 salary and benefit increase that the employees all well deserve. Take it out of the $450,000 earmarked for Budget Stabilization! The money is there so I feel the board is lying. If the budget goes down and the employees aren’t fairly compensated—shame on the self-appointed, unelected board for giving taxpayers a false choice. I hope the community would stand in support of the employees should they not be given a fair wage. We’ve already approved tax increases year after year and the board has chosen to keep salaries down (some years employees received 0% increases—why do you think a union went in, folks?) while the self-appointed board chose to hoard our tax increases year after year. $4 million is sitting in a bank account to renovate a new building. What a waste. To me, bottom line, self-appointments at taxpayer funded association libraries are un-democratic and un-American and it’s unfortunate that an unelected board already has millions stashed away at taxpayers’ expense to spend on building expansions and renovations on a new building that don’t go out for a community vote but on the other hand says there is no money there for employees. How duplicitous to hinge this year’s budget vote on salary increases alone. My vote of no is a message that I do not believe in taxation without representation.